Japanese refiners have loaded Iranian oil onto a tanker, resuming imports after halting purchases because of sanctions by the United States, a spokesman for a Japanese refinery and an Iranian official said yesterday. Japan is the last of the four biggest Iranian oil buyers in Asia to resume imports after receiving a waiver from US sanctions on crude imports that started in November. China and India maintained their imports after November while South Korea halted imports for four months, resuming them over the weekend. Iran is the fourth-largest oil producer among the members of the Organisation of the Petroleum Exporting Countries. “After China, South Korea, India and Turkey, Japan also started the process of importing Iranian oil,” Abdolnaser Hemmati, the governor of the Central Bank of Iran, said according to the state news agency IRNA. Japanese refiner Fuji Oil Co lifted a cargo of Iranian crude oil over the weekend, a company spokesman said. The very large crude carrier (VLCC) Kisogawa loaded about 2mn barrels of Iranian oil on Sunday and is expected to reach Japan on February 9, according to the Fuji spokesman and Refinitiv Eikon data. Fuji Oil owns about half of the oil onboard, while Showa Shell Sekiyu KK owns the remainder, the Fuji spokesman said. 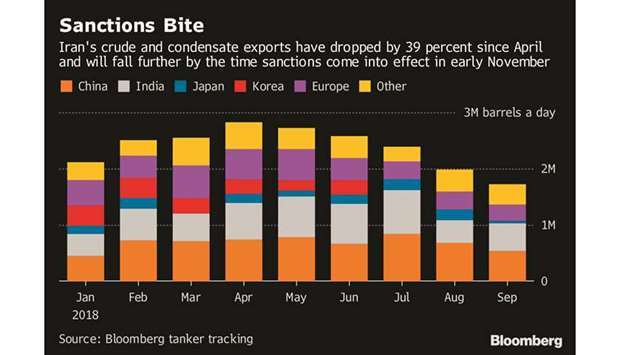 Still, the Iranian exports to Japan, the world’s fourth-biggest oil import, may be short-lived as two buyers based in Japan said they may not be able to continue after annual tanker insurance backed by the Japanese government expires in March. Iran’s oil exports have fallen sharply since US President Donald Trump said in May 2018 the United States would withdraw from a pact curtailing Iran’s disputed nuclear programme and reimpose sanctions on Tehran. Japan stopped oil imports from Iran in November when the sanctions came into effect. Iranian oil accounted for 5.3% of Japan’s total crude imports in 2017. On Saturday, South Korea received its first Iranian oil cargo in four months.